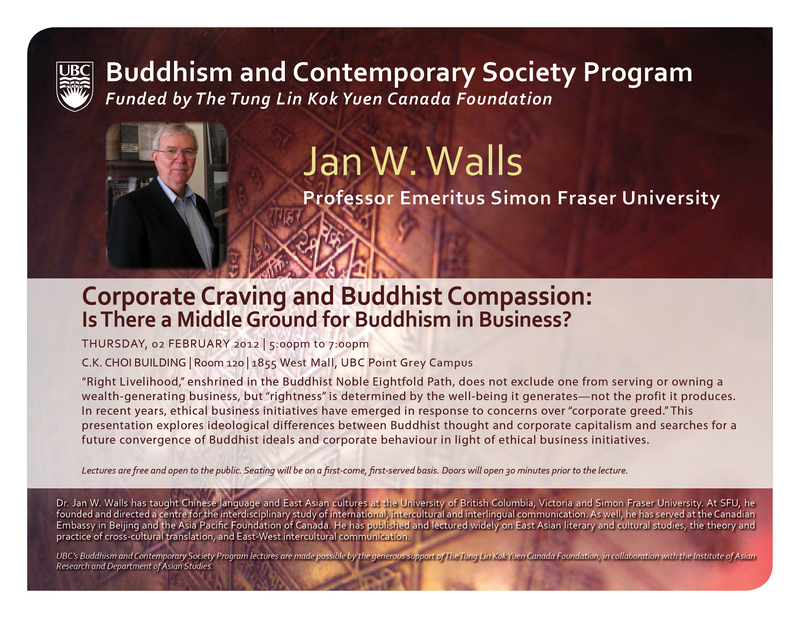 UBC’s Buddhism and Contemporary Society Program presents a lecture by Jan W. Walls. Lectures are free and open to the public. Seating will be on a first-come first-serve basis. Doors will open 30 minutes prior to the lecture. To download a .pdf poster for printing: Jan W. Walls Poster. The choice of “Right Livelihood” is so important among primary Buddhist values that it has been enshrined in the Noble Eightfold Path. “Right Livelihood” does not exclude serving or owning a wealth-generating business, but the rightness of a livelihood is determined not by the amount of material wealth it produces, but rather by the well-being it generates. Since the business of businesses today is the pursuit of as much profit as markets and laws allow, isn’t “Buddhist business” an oxymoron by its very nature? In recent years, owing to widespread concern over “corporate greed”, many “ethical business” initiatives have emerged and continue to grow. Assuming that “ethical business” and “Buddhist business” should have much in common, this presentation looks at the diametrically different starting points of Buddhist thought and free enterprise corporate goals, then considers the recent ethical business movements in search of a future convergence of Buddhist ideals and corporate behavior. After completing his B.A., M.A. and Ph.D. degrees in Chinese and Japanese languages and literatures, Dr. Walls began his academic career teaching Chinese language and East Asian cultures at the University of British Columbia (1970-78) and the University of Victoria (1978-85). In addition to teaching at UVic, he founded and directed the Center for Pacific and Oriental Studies. From 1981 to 1983 he served as First Secretary for Cultural and Scientific Affairs at the Canadian Embassy in Beijing, and from 1985 to 1987 he was Senior Vice President of the newly established Asia Pacific Foundation of Canada, where he founded and developed their first Education and Cultural Affairs programs. In September, 1987, he joined Simon Fraser University, where he founded and directed a center for the interdisciplinary study of international, intercultural and interlingual communication at SFU’s Harbour Center campus in downtown Vancouver: the David Law Center for International Communication.He also founded and directed SFU’s Asia-Canada Program, an interdisciplinary minor or intensive minor program for undergraduate students. He has published literary and cultural studies and translations, and lectured widely in the fields of East Asian languages and cultures, East-West intercultural communication, and the theory and practice of cross-cultural translation. BCS Program lectures are made possible by the generous support of The Tung Lin Kok Yuen Canada Foundation.